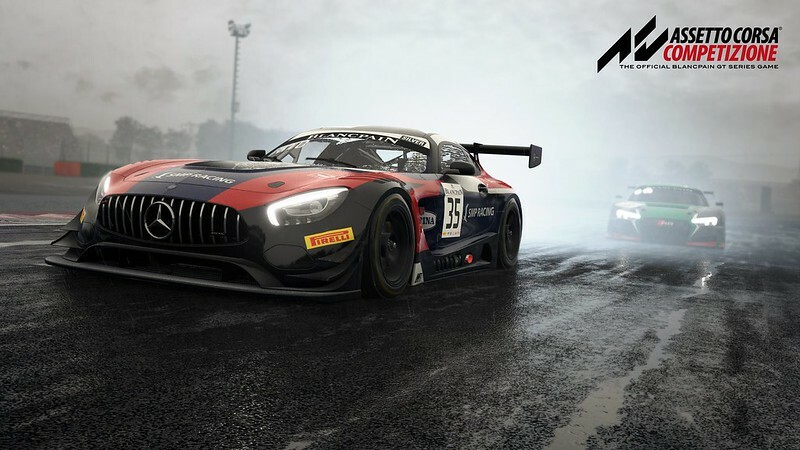 Kunos Simulazioni deployed a new hotfix for Assetto Corsa Competizione. Update v0.7.1 addresses some Release 7 issues. Restart your Steam client to download. Fixed a bug in some tracks where pitwall proximity would invalidate the lap. Removed penalty audio message at the end of the race. Fixed incorrect #26 Special Event description. Fix for MFD losing focus after a pitstop. Fix for potential setup initialization issues when changing game modes. Fix for Real-Time display showing lapped entries in non-race sessions. Missed changelog entry from initial release: default keyboard mappings have been changed to free up the arrow keys for MFD navigation. Fixed auxiliary light mesh not fitting the Nissan GT-R Nismo GT3. Fix for lack of expected rain probability with high variability percentages when setting high cloud density and dry track surface. Repair time added to teleport during race. Fixed wrong damage message after teleporting to pit. Enabled 10 laps telemetry saving by default on Huracan GT3 Monza preset setups.